Hello fellow patrons of Gulf Coast Conference (GCC) or blog newcomers! Welcome to this quick recap, covering the two presentations I gave during GCC. Those of you who were lucky enough to endure my back-to-back presentations, kudos. I’m glad you can stand me for an hour and hopefully, you learned something about gas chromatography – vacuum ultraviolet spectroscopy (GC-VUV). The topics I covered were the following: (1) using GC-VUV for detailed hydrocarbon analysis (DHA), locally known as verified hydrocarbon analysis (VHA), and (2) using GC-VUV for detecting and quantifying methanol in crude oil. Below, I listed the main points from each presentation and included links to their recordings! 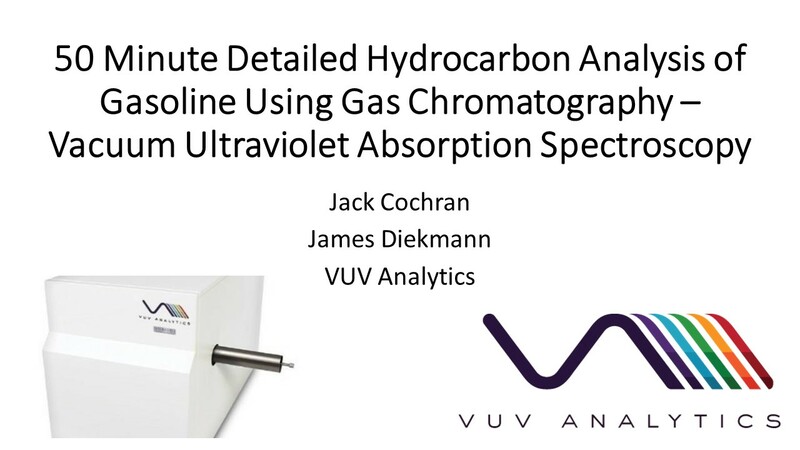 GC-VUV is a powerful technique for analyzing gasoline-range samples (ASTM D8071), including reporting mass and volume percent for carbon number, while classifying and speciating some compounds based on their absorbance spectra and retention times. The GC-VUV VHA method provides chromatograms and results like ASTM D6730, but in 1/3 time! Qualitative and quantitative PIONA accuracy are assured through VUV spectroscopy and hands-off VUV AnalyzeTM data processing, including for up to 150 speciated compounds, covering 90% of the composition of gasoline. Traditional methodology for methanol in crude oil uses a complicated GC set-up, requiring direct injection and backflush. This increases the risk of gunking up the GC liner and column, which leads to data accuracy issues and downtime. Static headspace GC-VUV uses a simple single-column (no backflush) solution that only introduces volatile compounds from crude oil, saving the GC liner and column for better uptime and throughput. Static headspace GC-VUV demonstrates linearity from 5 to 1,000 ppm of methanol in crude oil (comparable to current ASTM methods), has acceptable RSD% (less than 9), and shows no quantitative bias for heavy and light crude oils. VUV absorbance spectra for methanol and other volatile compounds are unique, meaning if compounds coelute, they can be deconvolved to maintain qualitative and quantitative accuracy. If you have any questions, reach out to us here.